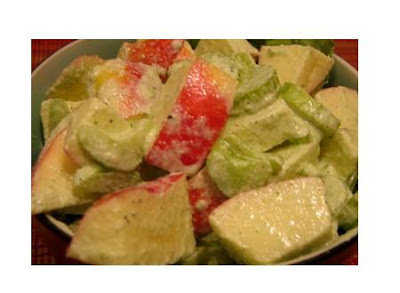 This cool salad of potato, apple and celery is very refreshing. It tastes best when chilled. 1. Place 4 cups of water in a pan with 1 1/2 tsp salt and baby potatoes. Bring it to a boil. Lower heat and cook covered till potatoes turn fork tender. Strain. 2. Core apples and cut into 1/2 inch cubes without peeling. Chop the celery stems. 3. Place potatoes, apples and celery stems in a mixing bowl. Add 1/2 tbsp oil and lemon juice. 4. Add salt and pepper and mix well. Cover and chill in the fridge for 1 hour. 5. Just before serving, add the mayonnaise and 1/2 tbsp oil. Gently mix and serve chilled. Note- Cut apples just before mixing and immediately add lemon juice and oil to prevent discoloration of apples. Healthy Bytes- All of us have heard that ‘an apple a day keeps the doctor away’ but few of us realize its meaning. Consuming apple reduces your risk of cancer, cardiovascular disease, diabetes and asthma. It’s also helpful in keeping Alzheimer at bay. Celery also known as shalari in hindi, is a good source of vitamin C thus it supports immune system. It helps release cold symptoms. Celery is helpful in reducing blood pressure and helps improve cardiovascular health.